Th-INK-ing of You: Great Is Your Faithfulness! The challenge is to use no stamped image but only words, sentiments, verses. So no picture images. I love the verse Candace chose because it reminds us that God has given us all we need to know about Him and about how He wants us to live... and it's in His Word. Our job is to read it, study it, apply it, love it, obey it. How well would we know our family members and other people in our lives if we never spent time with them? We have to spend time talking with our loved ones, listening to them, hearing what's important to them. As we do this, we grow closer to them and begin to change our own ways to please them more, and it's the same with God! When we take time in His Word... it becomes a light in the darkness that's all around us. It leads us in the way we should go. It tells us who God is and what He wants from us! It tells us the real meaning to life, our purpose, our value to God, and that He dearly loves us. It tells us about sin, and how it separates us from a totally Holy and righteous God. It tells us that He so loved us that He sent His Son to pay the penalty for our sin, so that through faith in His shed blood, we can come into right relationship with God. It tells us the answers to all life's questions. Granted, sometimes those answers don't come easily. But He promises that those who diligently seek Him will find Him. He has given us the light we need to guide our steps... let's be sure we are availing ourselves of all He's given us! 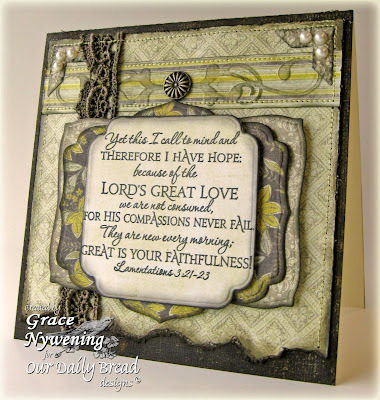 So for my take on today's challenge, I used an Our Daily Bread designs set, Scripture Collection 1. I chose this wonderful verse from Lamentations, because in thinking about God's Word... I think of His love, mercy and faithfulness to us. Doesn't this verse make you want to break into song... Great is thy faithfulness... Lord unto me! The sketch I used today is from Midnight Madness58 and I used a base by Coredinations which I lightly sanded to expose the core color. The papers are from PinkPaisley Queen B pack. I have torn the lower edge and used the faux burned technique. I used spellbinders labels 12, 5 and curvy rectangles and a CB embossing folder. I have added two Sizzix corner pieces and pearls to qualify for the OCCC challenge this week "got you cornered". I did some sewing and added this beautiful lace that was a gift from my sweet friend Pat. I'm almost out of it and am sad to see it go, as I can't find anything like this around here! Thank you Pat!!! Our sponsor this week is Paper Jewels. They are donating a $15.00 gift certificate! This is the kind of card you could put in a picture frame... it's beautifully designed. This is just stunning Grace, love the dp and the the lace. Have a great day. WOW - what an elegant card! I agree with Becky - frame it. GORGEOUS!! Your layering is amazing on this one. Here’s to another wonderful week with the Midnight Madness Challenges. Thanks for playing with us.. we love checking out your work. Grace, I always look forward to your creations for the Midnight Madness Sketch Challenge. My gosh, this is totally AMAZING. LOVE the verse, your use of the nesties, the torn burn effect, lace and corners. You did an INCREDIBLE job!! Thanks SO MUCH for playing with us this week and I hope you can join us again next week! What a beautiful card Grace,i love your psalm. Grace, this is just a stunning card with such quality and layers! I so appreciate your thought today. hugs! Gorgeous card Grace... as always! I love all the layering and the fabulous vintage look! 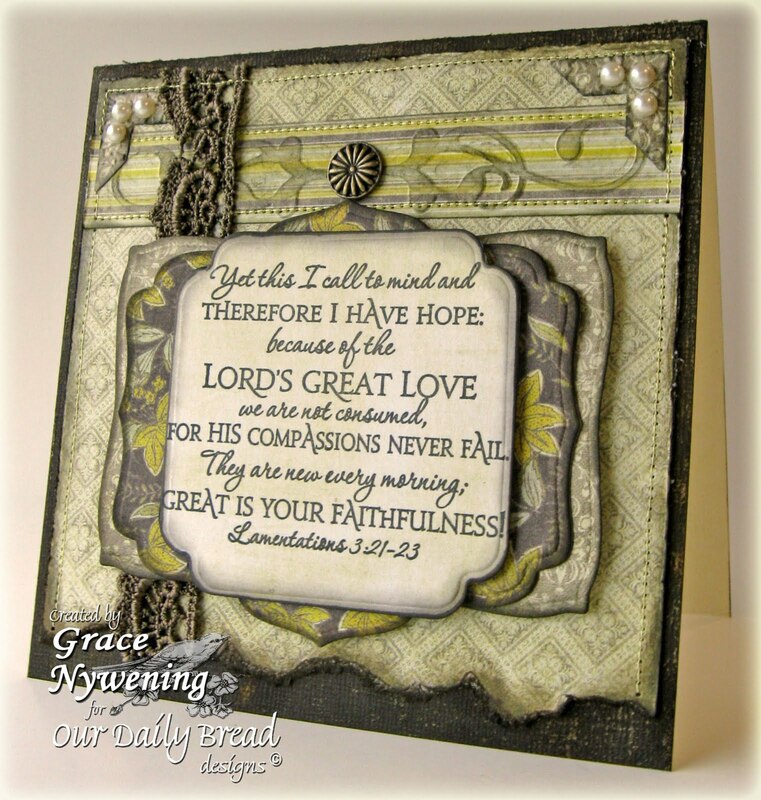 Just beautiful, Grace, and I love the verse from Lamentations. I agree--this is another of your frame-able artwork! Such a beautiful card...Just stunning! Grace you do such exquisite work. I love the understated colors that let the verse stand as the focal point of this splendid creation. So charming and stylish. Great job with the sketch. Thanks for playing along with us at Midnight Madness. WOWZA Grace this is GORGEOUS!!!!!! Fabulous, Grace! Everything is just so beautiful. I wonder if Pat can see this...hmm...that is beautiful ribbon to go along with that gorgeous card to accent that amazing scripture to magnify your words that are so very true!! Thanks Grace, for all you share with your heart and your talents!! Wowza!! Stunning card, more like a work of art really! Grace your cards are always beautiful, it's such a pleasure to visit you. OMGosh Grace this is just stunning!!! Such elegance, wonderful colours and fabulous design! !